There are different types of metal detectors on the market for different uses. For example, the portable metal detectors for safe guaranty in the public entrance such as railway station, airport and supermarket etc, walkthrough metal detector for safeguard the safety in important meetings and exhibition. However, people may be strange about the gas leakage detector which can be used for the early alert before the leakage of the gas so as to reduce the fire hazard and serious air pollution. The old saying is both the fire and water have no mercy. It's usually to see that due to some people's carelessness, there are always fires accidents appear here and there in people's daily life and generally people will suffer great losses not only property but also even lives. Then if there is a device to prevent the tragedy from happening in advance, our modern life will be better and safer. This new and high quality early alert high security gas leakage detector alarm is used to locate combustible gas leaks rapidly, which can give a good protection to the fire disasters. The early alert detector alarm is an environmental economy device with high temperature resistant and corrosion resistant which can be convenient to install and be able to work in various conditions without damaging the device itself. It is known to all that the gas is always stocked in airtight and dry places where any smoke and fire is not allowed. Made of high quality material this high security detector has the features of stock-proof, good durability and dustproof. It can make a good adaption to the occasions which stock the gas and work normally and continuously for the insect prevention. Because of the super environmental suitability and stability and excellent reliability, this gas leakage detector can be used in any room. What’s more, the sensor head of the high security detector is durable and it has the function of self test, the life span of the device can last for a long time and the operation is easy for the group of people who are not professional in this field. Most importantly, this high accuracy equipment has the loud sound signal of 85 dB al alarm mode, when there is gas leakage in the work station, people can be informed instantly and have enough time to deal with the unexpected accident before it gets worse. With the development of the high technology, there are more and more security devices which have been invented to facilitate people's daily life. It seems that all of us live in a happy and peaceful world. But there are always some sudden happenings that can be over our expectation such as the fire accidents result from the gas leakage. Therefore the early alert detector is necessary and should be paid attention the importance of it. 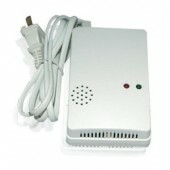 If you want to find a good such one detector for your daily security use, come to www.detectorall.com without hesitation.